Is Marketing Cloud DROWNING your customer experience? It's time to improve your customer interactions with a comprehensive and unified CRM, Marketing Automation and Workflow Engine. Oh, and X2CRM is super customizable too. If you are currently using Marketing Cloud and Salesforce, you are likely suffering from a lack of cohesive data sharing between Marketing Cloud and Salesforce.com, causing a frustrating breakdown of your marketing engagement, customer journey and real-time communications. Additionally, you are paying the extremely high costs of licensing, supporting, maintaining and customizing two separate systems. X2CRM is built as a comprehensive suite that is easily customized, and built on a single engine and data structure so you will no longer need to work with or pay for two applications from two different companies, and navigate disparate platforms and customer data. As a special offer because we are so confident in our service, the next two Marketing Cloud and Salesforce.com replacements purchasing an annual X2CRM subscription will receive our white glove migration services free (a $5,000 value). Experiencing duplicate data, disrupted workflow, synchronization problems? That’s because the Salesforce.com CRM, Marketing Cloud, and Pardot are entirely separate systems, where every component is built differently. 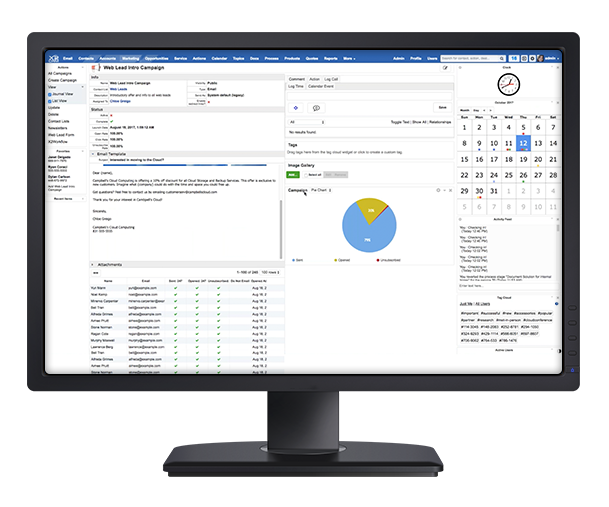 X2CRM has a cohesive stack, a single database, and a single Cloud infrastructure. "Make the Move to X2CRM from Salesforce.com and Marketing Cloud"
This PDF shares how existing Marketing Cloud and Salesforce.com customers are frustrated with relying on two separate SaaS solutions to handle Marketing Automation and Sales Force Automation. Interested in the free Marketing Cloud and Salesforce.com migration? Want to know more about how X2CRM can move you away from the headaches of Marketing Cloud and Salesforce?